Remember the movie Bottle Shock a few years ago? This is the wine that was in it, and has a big role in the history of wine in this country. Most people hear Chardonnay and think big and oaky – which is what most California Chardonnay is at this point. 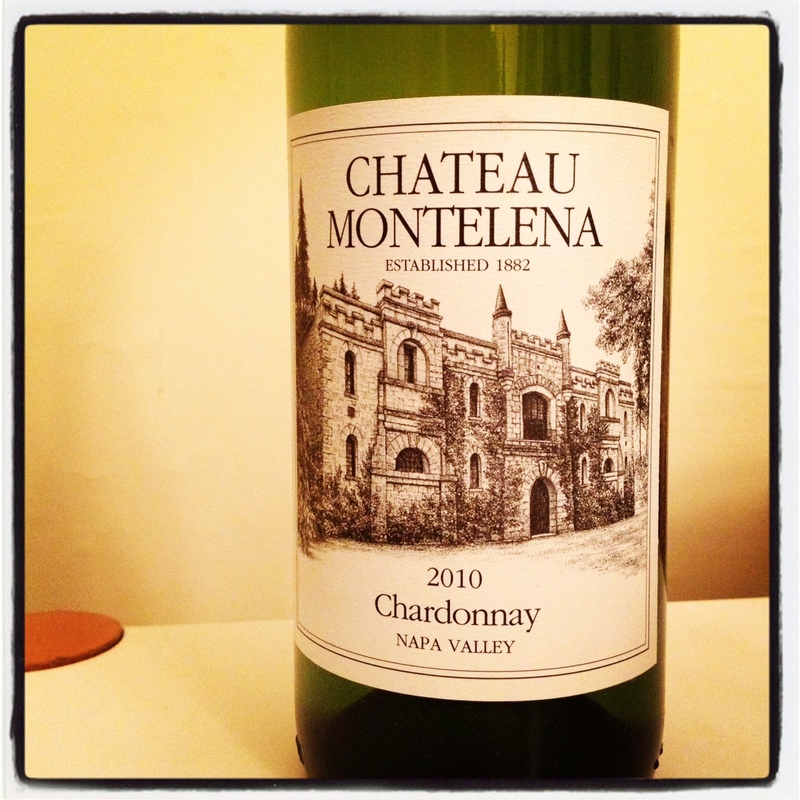 But that’s not how it started out, and Chateau Montelena lets the real taste of Chardonnay come through. Back in the 70s, new winemakers in California just started mimicking everything that people in Burgundy did with their Chardonnay, because it’s the best Chardonnay in the world (my opinion, but a lot of people agree). But the climate and soil are very different in France than they are in California, and the exact same process for making wine will make a minerally, silky piece of amazingness in Burgundy and then a big fat oak bomb in Napa. Anyway, now a lot of American Chardonnay is so over-oaked you can’t even tell it’s made from grapes. White Burgundy remains one of my all-time hands-down favorite wines in the entire world – and it’s 100% Chardonnay. So don’t knock Chardonnay – just knock over-oaked versions of it if that’s what you hate about it. And check out the Chateau Montelena, about $40-45. Tags: bottle shock, burgundy, chardonnay, montelena, napa, wine. Bookmark the permalink. Previous post ← the grapefriend blend: my own chardonnay! Love Chateau Montelena! Plus their Cabernets are restrained and yummy too! I am not much of a Chardonnay drinker, but I can’t seem to get enough of Rombauer Chard. It’s the only one stocked in my house at all times.Plus, here in the bay area people can’t seem to get enough of it. Do you know any others that taste similar perhaps? 🙂 Love reading your posts by the way! I’ve never had that one so not sure what would compare. What do you like about it – fruit, oak, acid, crisp? Tastes very buttery, hints of peaches and pears. Very creamy 🙂 You must try it! 🙂 They call it Danville “crack” where I live! Sounds like the La Crema or the Cakebread Chardonnays would be similar then – try those! Yes, you need to grab a bottle of Rombauer! Also try Melville, Clos Pepe, Au Bon Climat from Sta. Rita Hills. Throw in Failla, Freeman, Littorai from Sonoma. So many great chards! Thanks. I’ll look out for it over here! I’m not a big chard drinker, but I do enjoy this one. I also recommend the Cakebread Reserve Chard…light on the oak and fruit with a nice minerality! Love Cakebread! Am actually helping them run their photo contest – ending Friday if you’re interested! I like the cleanliness of the Montelena Chardonnay and the way Bo has been able to keep JIm and Mike’s stainless steel crispness amongst the oakiness. I have loved the Montelena and the Grgich Hills Chardonnay. I don’t know much of French wines, but I love the inexpensive Pernand de Vergelesses and I can see (taste) being confused between the two. French Chards are usually much cleaner and less overoaked in general. Often a good value for the table! I’d like to know why we raise a “toast” as opposed to a “grape”. First blogger to use a reference not from wikipedia gets a grape (untoasted). There are more Burgundian style Chard makers in Sonoma than Napa. Napa has become the Oak & Butter Bomb capital of Chardonnay. I’ve actually dubbed that kind of wine “Cougar Crack.” Some of my favorites that are more along the Burgundian style are MacRostie, Ridge Montebello Chard, Simi(Russian River) and I think someone else mentioned Littorai. Have heard great things about Littorai! I carried a Magnum of the 2000 Chardonnay home from a trip to Napa a few years ago and poured it last Thanksgiving, back in Miami, for only the worthiest of guests. I loved it s , I haven’t been able to dispose of the empty bottle yet and I usually have no trouble letting go. I also had to stop by to visit Mike Grgich to show my respects as well as taste. He, as you surely know made that winning chard for the Chateau in the Judgement of Paris Tasting and he’s still throwing down some mad good wine.